Castle Rock State Park has a few locations within 10 minutes of White Pelican with miles of hiking available. The north trails feature rolling hills, streams, and sandstone bluffs. The south trails have rolling hills and prarie and forest views. Inbetween the north and south trails is a stair hike that brings you to the top of a bluff for breathtaking views of the Rock River Valley. 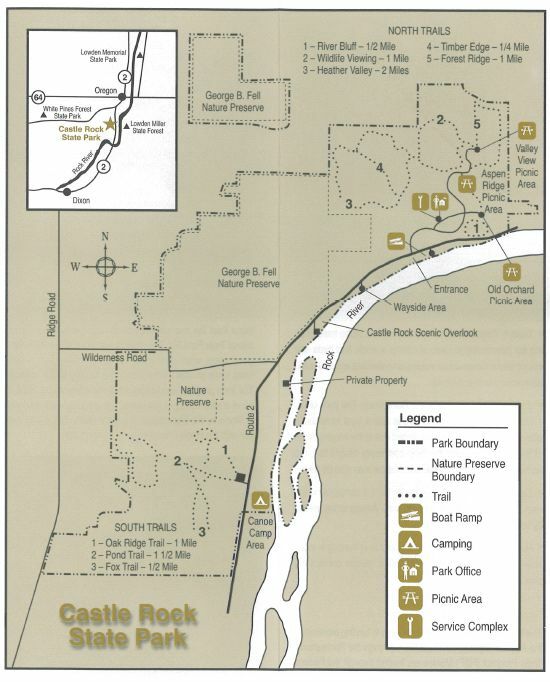 The canoe-in campground is part of the Castle Rock State Park system as well and is located on the Rock River inbetween Castle Rock and the town of Grand Detour. Castle Rock State Park is within a n 8 minute drive from White Pelican. Please click on the map for directions.